We’d love your help. Let us know what’s wrong with this preview of Unpopular Mr. Lincoln by Larry Tagg. Today, Abraham Lincoln is a beloved American icon, widely considered to be our best president. It was not always so. Larry Tagg's The Unpopular Mr. Lincoln is the first study of its kind to concentrate on what Lincoln's contemporaries actually thought of him during his lifetime. Be forewarned: your preconceived notions are about to be shattered. Torn by civil war, the era i Today, Abraham Lincoln is a beloved American icon, widely considered to be our best president. It was not always so. 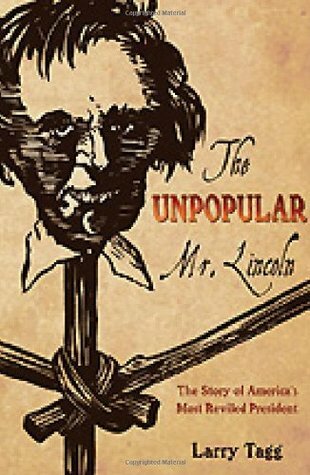 Larry Tagg's The Unpopular Mr. Lincoln is the first study of its kind to concentrate on what Lincoln's contemporaries actually thought of him during his lifetime. Be forewarned: your preconceived notions are about to be shattered. Boisterous and venomous enough to be good entertainment, The Unpopular Mr. Lincoln rests upon a wide foundation of research that includes years of searching through contemporary newspapers. Tagg includes extensive treatment of the political context that begat Lincoln's predicament, riding with the president to Washington, and walking with him through the bleak years of war and up to and beyond assassination. Throughout, Tagg entertains with a lively writing style, outstanding storytelling verve, and an unconventional, against-the-grain perspective that is sure to delight readers of all stripes. Lincoln's humanity has been unintentionally trivialized by some historians and writers who have hidden away the real man in a patina of bronze. Once readers learn the truth of how others viewed him, they will better understand the man he was, and how history is better viewed through a long-distance lens than contemporaneously. The bicentennial of Lincoln's birth will be celebrated in 2009 and will be the biggest year ever for public interest in Abraham Lincoln. The Abraham Lincoln Bicentennial Commission created and funded by Congress will "inform the public about the impact Abraham Lincoln had on the development of our nation." The year will also witness the release of Steven Spielberg's long-awaited movie on President Lincoln. Of all the Lincoln books slated for publication, The Unpopular Mr. Lincoln will be the "must-read" title for general readers and scholars alike. To ask other readers questions about Unpopular Mr. Lincoln, please sign up. This is a superb short little book on the relationships of the press (and assorted writers and diarists) to Lincoln. Though the references at the end reveal most of the quotations come from secondary sources and not archival research, it is still quite comprehensive and wind-ranging within the scope of the thesis. It also functions quite well as a work of popular history. The book begins with a very nice succinct summary of the political situation of the US at the point in 1860, with background i This is a superb short little book on the relationships of the press (and assorted writers and diarists) to Lincoln. Though the references at the end reveal most of the quotations come from secondary sources and not archival research, it is still quite comprehensive and wind-ranging within the scope of the thesis. It also functions quite well as a work of popular history. The book begins with a very nice succinct summary of the political situation of the US at the point in 1860, with background info (chapters 2-5). It can be skipped by those familiar with it, though I recommend at least the chapters on party and political patronage. From there it progresses chronologically, starting with the campaign and election of Lincoln, introducing key historical players alongside a generally lively recitation of events as they occurred. This is followed by quotes from a wide-range of newspaper sources from around the country. Most papers of the day were very associated with particular parties and the party point of view, and Mr. Tagg supplies helpfully supplies the political biases the first time they're mentioned in a chapter, except for the ones that are so important they appear every chapter (Horace Greeley's Tribune for instance). Quotes from letter-writers and diarists are also frequently mentioned. Polish exile Adam Gurowksi is one of the most interesting of the latter, with repeatedly insightful comments--so much so that I'm planning to follow up with reading his dairies at some point. Of course, from the title, it's clear that most of writers are extremely critical, from all sides of the political spectrum. Lincoln's inherit moderation and his tendency to keep his long-term plans close to his chest (and his homeliness) were not aspects that endeared him to either crowds or journalists. And the long war, where the Union armies suffered setback after setback, left many putting all the blame on Lincoln, again and again. Only at the tail end are there really positive statements (though Tagg does give us what southern papers wrote as well, and of course, until occupation, they were particularly unrelentingly vitriolic). I won this hefty peice of beef on Goodreads. While I was dying to dig in and rip through this read like every other book I pick up, I found that wasn't going to happen. The book was obscenely informative with a fresh new perspective. It was intense and historical so it took me eons longer to read than a work of fiction. I felt myself wanting to reread or go through the book and take notes. You think you knew about Lincoln and then you find out you really didn't. I still believe Lincoln was one of our greatest President's although this book makes him appear all the more human. I cannot think of a politician today who could have the courage of his convictions in the face of all the criticism that President Lincoln faced in his day. Not only from the opposing party, but from the press and even members of his own cabinet the insults and defamation he had to endure would surely have destroyed a lesser man. The book’s Abraham Lincoln is about seven feet tall, by today’s height standards, topped with a shock of unruly black hair, clad in an ill-fitting suit, unattractive if not ugly, speaking in a high voice with a distant western twang. He is not socially adept, prone to bluntness and seems not to consider the feelings of his peers. The man in the middle, he is trying to hold things together while being attacked for going fast/slow in the right/wrong direction from all sides at the same time. That both portraits are Abraham Lincoln and that the author can reconcile these different ideas shows what a well-written book this is. This was a slow and often difficult read for me. Not because the author did a poor job but because I had to reconcile my Lincoln to the actual man and the times. We have all read about the political and personal attacks on Lincoln during his presidency. We have read that the years after his death were much kinder to him than the years he was President. I know we do not understand how different these two eras are and how much the image of Lincoln has changed. This book is a major step in giving the reading public that understanding. Larry Tagg gives us a short introduction covering Lincoln’s nomination and election. Combined with a look at American life and politics in the years leading up to the election of 1860, we have a good foundation. The book concludes with an explanation of constructing the Lincoln of legend and how many factions found building the legend useful. In between is a very solid political history of Lincoln’s administration, the negative reactions and personal attacks. Lincoln’s election is not the result of personal popularity; he receives fewer votes than the loser in past elections, but the collapse of the national political parties. While not on Southern ballots, he is not popular in the Democratic strongholds of major Northern cites nor is he the choice of the Radical Republicans. Negative reactions and comments start right after the election and never stop. The Baltimore Plot is just the first incident that provides the press with material. Once the war starts the democratic papers are largely silenced by the combination of patriotic mobs and government action. The author handles this story in a nonjudgmental tone avoiding any fiery rhetoric on this highly charged subject. This is one of the strongest points in the book, as the story has many sensitive subjects. Another well-written comprehensive section is the election of 1864; Lincoln’s nomination, Chase and the role of the Radicals make an exciting mix. The author traces each of these in both the press and historically giving the reader a ringside seat on the double-dealings, back stabbings and ultimately Lincoln victory. This is well written, informative and enjoyable reading. In an excellent book, this was my favorite section. Another excellent section of the book is the fight over slavery and emancipation within the Republican Party and Lincoln’s Administration. This very strong writing will upset many people. Lincoln is the man in the middle, determined to keep the coalition of War Democrats, Border States, Republicans and Abolitionists focused of preserving the Union. The Radical Republicans and Abolitionists launch some of the harshest and most persistent attacks on him. This is an excellent history of not only the fight for emancipation but the start of Reconstruction politics too. Another well-done area is the fight between an activist President and a Congress in the process of losing control to him. It is easy for us to miss how much power Lincoln took from Congress and how bitterly they resented this. That they were the same political party seems to have occurred to many rarely. This is a wonderful and unique look at Lincoln’s presidency. The book is full of information, thought provoking and readable. You may find that it is necessary to reread paragraphs to reconcile “our” Lincoln with the “real” Lincoln. I did and knew that I was really learning each time that happened. Had not realized how incredibly unpopular, how HATED, Abraham Lincoln was in his time. This author depicts him as a man almost universally despised - yet he won a second term (just barely) during the war. This book illustrates how little politics and pundits have changed over the centuries. It was a fascinating read, but it turned tedious as Tagg keeps piling on all the nasty notes, speeches and articles on President Lincoln without giving the reader a break from the vile criticism.